Lemon Essential Oil has a strong citrus scent. 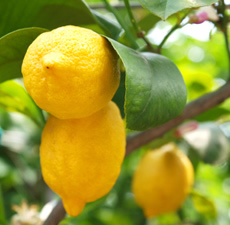 The Lemon tree was originally a small thorny evergreen tree native to India. It is now common in Southern Europe, Florida and California. Lemon Essential Oil has been historically recognized as a cleanser. It is reputed as being antiseptic, and as having refreshing and cooling properties. On skin and hair it can be used for its cleansing effect, as well as for treating cuts and boils. Research has also shown Lemon Essential Oil to enhance the ability to concentrate.